Square Roots: The Story of SpongeBob SquarePants – From SpongePedia, the biggest SpongeBob-wiki in the world! 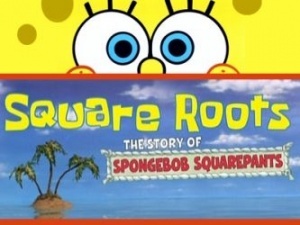 Square Roots: The Story of SpongeBob SquarePants is a documentary produced by acclaimed producer Creadon O'Malley that aired on VH1 on July 14, 2009. The documentary chronicles the pop culture success of the animated series SpongeBob SquarePants, including its impact on many people including President Barack Obama, the inmates of San Quentin State Prison, and children around the world. A commentary from the creator of the show, Stephen Hillenburg and cast/crew members is featured, along with an opening song from Avril Lavigne and appearances by celebrity fans such as LeBron James, Ricky Gervais, Craig Ferguson, Alec Baldwin, Chris Pine, Keke Palmer, and Rosario Dawson. It also aired on Nick at Nite on July 23rd, 2009 at 10:00 P.M. Eastern Time. The documentary was included on The First 100 SpongeBob Episodes DVD. This page was last modified on 22 June 2012, at 07:00.